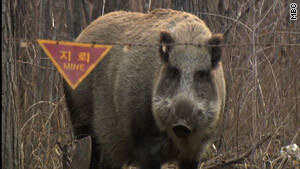 The demilitarized zone that seperates North and South Korea has become a safe-haven for wild animals. (CNN) -- While the world remembers the fall of the Berlin Wall 20 years ago, one frontier of the Cold War remains intact; the demilitarized zone that separates North and South Korea. Formed after the Armistice Agreement in 1953, the thin ribbon of land between the two countries that are still technically at war is one of the most heavily armed areas in the world, but it has also become an accidental paradise for wildlife. A South Korean MBC TV crew recently returned from an 18-month shoot that took them beyond the barbed wire and gun-turrets to record a documentary on the rare species that have made it an oasis from human interference. "One of the things that makes it so special is that it has nearly all the eco-systems you'll find in Korea," Mark Strickson, a zoologist and producer of the documentary for NHNZ told CNN. The 4-kilometer-wide by 250-kilometer long (2.5 miles by 155 miles) DMZ includes wetlands, forests, mountains, rivers and coastlines. Temperatures can range from 20 degrees Celsius (68 degrees Fahrenheit) to a debilitating minus 20 degrees Celsius (minus 4 degrees Fahrenheit) in winter. While relations between the two sides are still waiting to thaw, the area has become a winter migrating post for rare white-naped cranes, a haven for one-third of only 2,500 red-crowned cranes left in the world and home to almost 200 other species of birds and 52 species of mammals, including Korean water deer and Amur goral. There they may be free from the hunter's rifle, but they are not completely free from human contact or immune to the conflict between the two sides. Wild boar that have lost legs to landmines can be seen hobbling out from the forests, and when two gorals face each other from either side of the border fence it is hard to tell which one is in the safest area. As well as some stunning shots of the wildlife they also gleaned a small insight into the life of the billeted soldiers; giving wild boar scraps of food near their mess, and lobbing potatoes over the barbed wire fence, to feed the goral during the harsh winter months. Unconfirmed sightings of big cats, including Siberian tigers and leopards, have also been reported in the DMZ by soldiers, but were not seen by the camera crew. "If there were some tigers, they'd be struggling because of the area that tigers need to support themselves. But certainly leopards, it's the perfect place for them to be. There's no reason why they shouldn't be there," Strickson said. A tiger sighting would complete the picture of the DMZ as an oasis of natural wonder, a reason why the non-governmental organization, The DMZ Forum, is supporting a joint research trip by both sides to find evidence of the rare big cat next year, the Chinese year of the Tiger. "The forum's role is very neutral. We are focusing on nature and animals and human rights. We try not to be involved in the political process and the nuclear talks, we try to focus on tigers, leopards and cranes," Dr Lee Seung-ho, co-founder of the DMZ Forum told CNN. Established in 1997 to promote peace and conserve the DMZ's biodiversity, last year it embarked on a project to encourage North Korean farmers of the Anbyon plain to preserve the area so red-crowned cranes can return. But the DMZ Forum's efforts go beyond the tangible -- of tractors and organic farming; its real aim is to change the common perception of the DMZ. "We're trying to change the view or concept of DMZ from fear, threat and landmines; change it from negative ideas to positive ideas of natural treasure, so we can build peace and prosperity. Our role is to change the world's view. We need to educate the world and the people of North and South Korea to keep it," Dr Lee said.